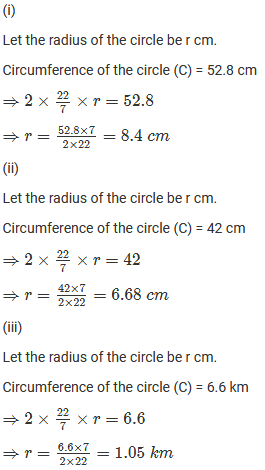 The ratio of the radii of two circles is 3 : 2. 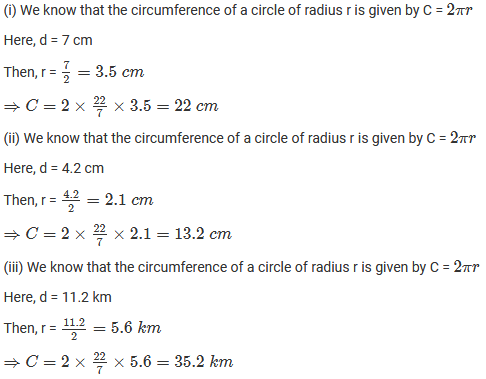 What is the ratio of their circumferences? So, let the radii of the two circles be 3r and 2r respectively. A wire in the form of a rectangle 18.7 cm long and 14.3 cm wide is reshaped and bent into the form of a circle. 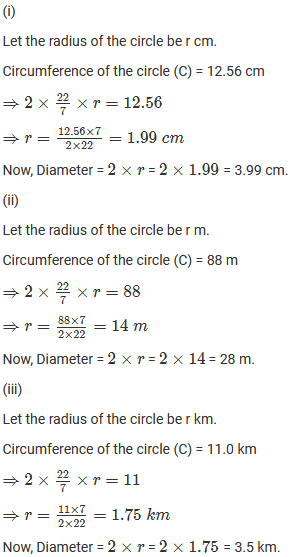 Find the radius of the circle so formed. 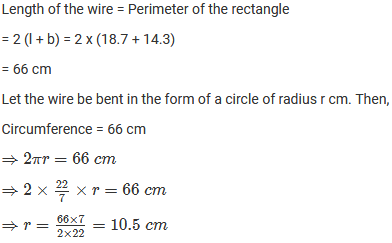 A piece of wire is bent in the shape of an equilateral triangle of each side 6.6 cm. It is re-bent to form a circular ring. What is the diameter of the ring? The diameter of a wheel of a car is 63 cm. 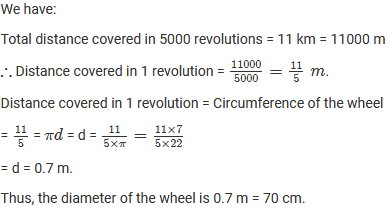 Find the distance travelled by the car during the period, the wheel makes 1000 revolutions. It may be noted that in one revolution, the cycle covers a distance equal to the circumference of the wheel. ∴ Circumference of the wheel = πd = 227 x 63 = 198 cm. Thus, the cycle covers 198 cm in one revolution. ∴ The distance covered by the cycle in 1000 revolutions = (198 x 1000) = 198000 cm = 1980 m.
The diameter of a wheel of a car is 98 cm. How many revolutions will it make to travel 6160 metres. The moon is about 384400 km from the earth and its path around the earth is nearly circular. Find the circumference of the path described by the moon in lunar month. 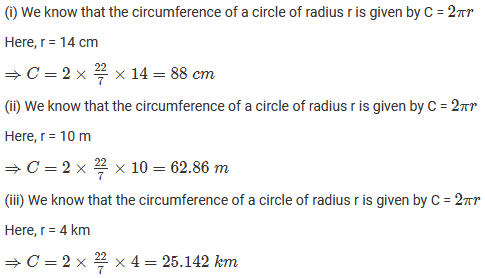 How long will John take to make a round of a circular field of radius 21 m cycling at the speed of 8 km/hr? The hour and minute hands of a clock are 4 cm and 6 cm long respectively. Find the sum of the distances travelled by their tips in 2 days. A rhombus has the same perimeter as the circumference of a circle. 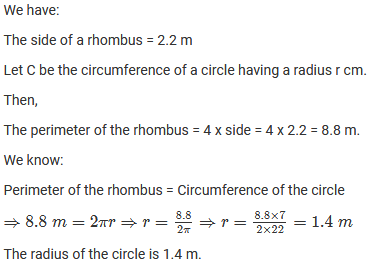 If the side of the rhombus is 2.2 m. Find the radius of the circle. 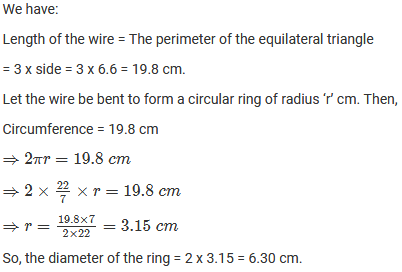 A wire is looped in the form of a circle of radius 28 cm. It is re-bent into a square form. 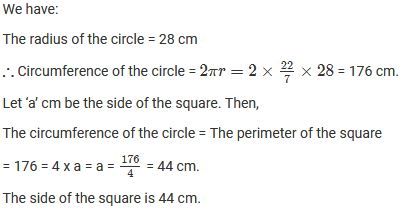 Determine the length of the side of the square. A bicycle wheel makes 5000 revolutions in moving 11 km. Find the diameter of the wheel. A boy is cycling such that the wheels of the cycle are making 140 revolutions per minute. 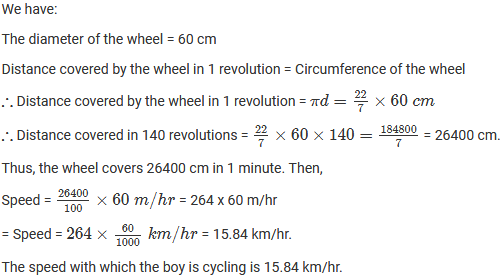 If the diameter of the wheel is 60 cm, calculate the speed per hour with which the boy is cycling. The diameter of the driving wheel of a bus is 140 cm. How many revolutions per minute must the wheel make in order to keep a speed of 66 km per hour? A water sprinkler in a lawn sprays water as far as 7 m in all directions. Find the length of the outer edge of wet grass. A well of diameter 150 cm has a stone parapet around it. 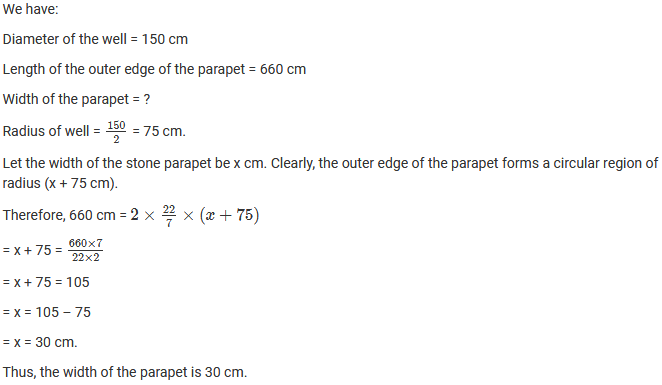 If the length of the outer edge of the parapet is 660 cm. then find the width of the parapet. An ox in a kolhu (an oil processing apparatus) is tethered to a rope 3 m long. How much distance does it cover in 14 rounds?